Milo has lived many, many lives. And he remembers them all. Live a life as an investment banker, live the next as a water bug. So many, many lives. Takes a few to reach enlightenment. Some souls take time, some take a lot of time. Milo’s about at his life limit. Seems a soul can be canceled like a bad sitcom if it can’t get it right. We readers are Milo’s companions on his voyage backward and forward through time. And like the many past lives that haunt his present, cheering him on, and lamenting his failures, we watch our hero survive (and not survive) the trials and tribulations that those many, many lives encompass. We even get to experience a bit of the afterlife with him. Turns out our boy’s in love with Death, or to be more accurate, an incarnation of that concept, a lovely woman who prefers to be called Suzie. She’s been on hand through the millennia to guide him from one life to the next, but she grows weary of her existence and knows it’s time to move on … for them both. 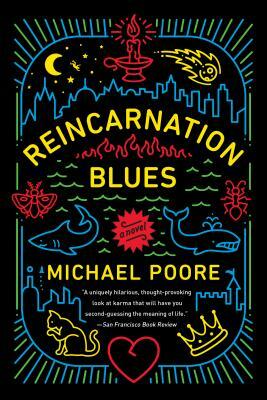 Reincarnation Blues is a fantastic look into the human condition told over ten thousand lifetimes. Highly enjoyable and recommended.